Some of you are reading this blog from right here in Lake Oswego. Others of you are reading from states and countries far away. Those of you who are local know what I am talking about, eclipse fever is burning hot and bright. Oh my goodness, so much build up to this event. 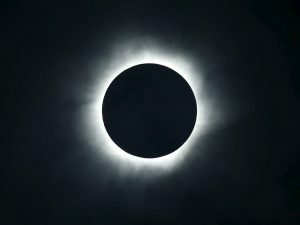 I was a college student attending Willamette University when the last total solar eclipse occurred in 1979 and totality went right over Salem, Oregon. I clearly remember the encroaching darkness, the totality, and the return to “normal” that was not normal that afternoon after having experienced an eclipse. I happened to be taking an astronomy class at the time and so had lots of wonderful insight. I didn’t have any proper eye protection to wear so I used a mirror to reflect the progression of the eclipse on the side of a building. I never did look directly at it. This time I am ready. I bought my viewing glasses many months ago. I have gone to the NASA web sight to make sure that they are correctly certified and manufactured, and I am excited! I will be in the path of totality with family and friends that I love. I am a 10-year cancer survivor. I learned that life brings you moments and that you need to grab those moments and experience them with joy and gratitude. I think the entire country is going to experience some of the eclipse, even if it is in a small measure. I hope for you that you grab the moment, enjoy it, and take in the wonder of what it is to be alive.